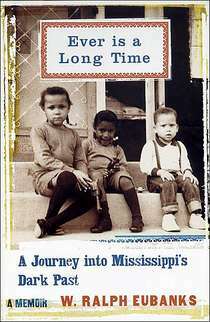 W. Ralph Eubanks prefaces his first book with his son’s innocent question: “Daddy, what’s Mississippi like?” Eubanks finds himself torn between protecting his children from the harsh truth of segregation, as his parents attempted to do in his own childhood, and educating them on the bittersweet struggle for civil rights. Over a period of several months, Eubanks debates how much of his past he should reveal to his children. He recalls his warm, sheltered childhood, but contrasts it against the turbulent backdrop of Mississippi in the Civil Rights era. He introduces the Sovereignty Commission, the arm of the Mississippi government that kept thousands of files on the state’s residents and monitored those individuals for any signs of subversive activity. When the files of the Commission become public in the late nineties, shortly after his son’s inquiry, Eubanks searches the files for his parents’ names… and reels in shock when both appear on his computer screen. Thus begins Eubanks’ years-long research into the activities of both civil rights activists and those seeking to curtail racial equality. He eventually resolves to revisit the “old home-place,” the site of both childhood joy and escalating racial tension. Eubanks notes that he experienced a very safe childhood, partly as a result of his parents’ wise move from the Mississippi Delta to a farm in northern Mississippi. Provincial yet friendly, Mount Olive, or “Mo’nt Ollie,” as Eubanks fondly calls it, seems the epitome of southern culture. Ralph followed his father to work every day until reaching the age to begin attending school. In this formative period of his childhood, he learned from his father how to garner and maintain respect, even in a culture that so often disrespected African Americans. However, despite his parents’ careful shielding, Eubanks slowly woke up to the turbulence around him as he watched protests on TV and read newspapers influenced by the heavy hand of the Sovereignty Commission. However, Ralph’s father did not want him to leave Mississippi to attend college, so Eubanks attended Ole Miss—yet another site that prompts memories composed of both joy and fear upon revisiting. Eubanks describes a peculiar kinship with the bullet holes punched into the stately architecture of a historic building on the day the first black student, James Meredith, was admitted to Ole Miss in 1962. This sentiment is an excellent example of the feelings that Eubanks has for Mississippi; a mixture of pride and a deep sense of tradition commingled with a sorrowful regret and almost bewilderment at the darker chapters of his home state’s history. He decides to return to Mississippi to peruse the archives of Jackson and Mount Olive, which contain much more information than he was able to find online, including detailed and shocking “cases” against innocent neighbors that resulted in countless cases of imprisonment and personal loss. In the archives, he finds reports on his mother from her supervisor in the public school system… a Klansman. Overcoming his trepidation and disgust, Eubanks arranges an interview with the man, only to find that his preconceived vision of a proud, defiant racist is far from the truth of the friendly man wracked by indecision and regret over his past actions. Eubanks also interviews Ed King, a controversial figure in the Civil Rights movement of Mississippi. After both meetings, he realizes that the actions of those involved on both sides cannot be judged in black-and-white morality. After years of research and soul-searching, Eubanks is finally able to answer his son’s question. Eubanks’ research offers insight into not only his history but also the wider story of the Civil Rights Movement. He oscillates between relating warm childhood memories and presenting the results of rigorous research. These and other discoveries, in combination with Eubanks’s candid discussion of his life, are part of what makes the multi-layered memoir so endearing. Eubanks struggles to integrate his past and his present even as he relates what integration was like. He attempts to synthesize the two worlds of his childhood – the safety of his own home versus the tumultuous atmosphere of Civil Rights-era Mississippi – with his adult world in Washington, DC. W. Ralph Eubanks is a resident of the Van Ness neighborhood and director of publishing at the Library of Congress. Stay tuned for a summary of his Politics and Prose reading of his second nonfiction work, The House at the End of the Road. F*ckin?amazing things here. I am very glad to see your article. Thanks a lot and i am looking forward to contact you. Will you please drop me a e-mail?